Josef found a job with Goliath cement and asbestos sheeting factory at Railton in northwestern Tasmania. His first business venture as a butcher failed but his second butcher shop in Burnie flourished. Over the decades he continued to expand his business. In 1982 he acquired the Huttons abattoir and smallgoods ham and bacon business in Tasmania which gave him a large increase in market share. In 1992 Josef was named Tasmanian Executive of the year having been the major contributor to the rationalisation of seven export works to two. Joe had 30 years experience in creating scale, quality, yield and new markets and wasn’t about to waste it. The wine industry in Tasmania, like the meat industry before it, was undergoing rationalisation where many participants were undercapitalised and unable to achieve the economies of scale necessary to take full advantage of markets and production. Joe was not a wine connoisseur but his palate had come to appreciate the distinctive quality of wines made from cool climate grapes. Sparkling wines made in Tasmania shine when given the right care and attention. In 1994 Josef waded into the Tasmanian Wine Industry, buying Heemskerk, Rochecombe and Buchanan Vineyards as well as establishing a completely new vineyard at Kayena. The Jansz sparkling wine was part of the acquisitions. 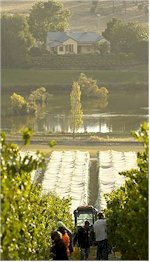 Josef’s Heemskerk Wine Group effectively became the second major participant in the industry in Tasmania, with production from the famous Pipers Brook Vineyards. In 1997 Josef was awarded the Medal of the Order Of Australia. 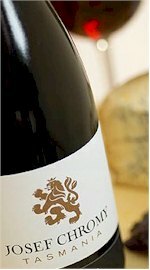 1997 also saw the Heemskerk Wine Group’s Chardonnay awarded Winestate’s “Chardonnay of the Year”, beating 841 Chardonnay’s from Australia and New Zealand. Again the same year, President Bill Clinton sipped Jansz sparkling throughout the entire evening at a dinner whilst visiting Australia. In March 2000 Josef Chromy experienced one of the most memorable moments in his life when he had the privilege to lunch with Her Majesty Queen Elizabeth II at a table of ten during her visit to Tasmania. In 2003 Joe Chromy sold Tamar Ridge Wines to Tasmania’s largest company Gunns Limited. Not long afterwards, Josef acquired Glenwood Vineyard on the southern outskirts of Launceston at Relbia. Joe knew the potential of this site, the vineyard overlooked picturesque small lakes and out over White Hills to Ben Lomond. Josef has built a new, state of the art winery at the base of the vineyard at Relbia. The clean, modern, minimalist exterior provides a home for some of the best winemaking equipment available. Wines produced under the Josef Chromy Range showcase the varietal expression of the cool climate vineyard site. Fruit reception begins with a vibrating hopper that gently shakes the grapes into the destemmer, which has a smooth plastic cage in order not to break any berries. The grapes are pumped into the press through a peristaltic pump, using the same gentle technology that transfers live fish or pumps blood during heart bypass surgery. A high tech German press enables juice extraction at low pressures, giving more delicate aromatic juices. Elegant, subtle and complex, the resultant wines reward cellaring and provide great accompaniment to food now. Josef has built a new, state of the art winery at the base of the vineyard at Relbia. The clean, modern, minimalist exterior provides a home for some of the best winemaking equipment available. Fruit reception begins with a vibrating hopper that gently shakes the grapes into the destemmer, which has a smooth plastic cage in order not to break any berries. The grapes are pumped into the press through a peristaltic pump, using the same gentle technology that transfers live fish or pumps blood during heart bypass surgery. Wines produced under the Josef Chromy Range showcase the varietal expression of the cool climate vineyard site. Elegant, subtle and complex, these are wines that will reward cellaring or provide great accompaniment to food now. All Pinot Noir is fermented in small batch open top fermenters and a pneumatic plunging device, co-developed by Josef, is used to gently plunge the cap and manage the extraction of colour and tannin during the fermentation. All the equipment and processes in the winery are designed to respect the delicate varietal flavours of the high quality, cool-climate Tasmanian fruit.